Soft and gentle touch can be created through the costume. Also its light weight makes it easy to handle with. In addition to RT original Costume, customers can choose or design costume of their own. Because of the lightweight structure, RIC can be easily carried by a single operator. RIC is operable by a game controller or PC. RIC Immediately starts up after turning its switch ON, which enables to respond to a sudden performance request. Stand-alone operation by rechargeable batteries or long time operation by connecting to external power supply can be selected. The size of character difficult to wear by a human adult is realized by RIC. The height is familiar especially for children. 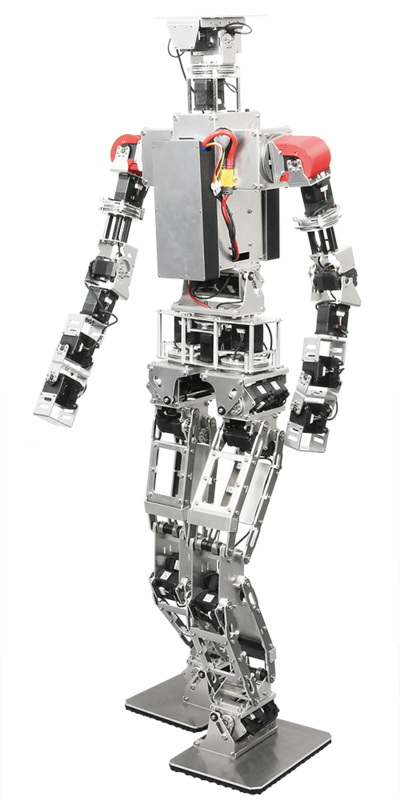 RIC is a humanoid robot that can communicate with people. Additional degree of freedom, generic sensors or various PC and OS can be installed. By saving the weight and dressing a costume, accidents such as jamming will be reduced. RIC is made to become lightweight for easy carrying and for safety. It is capable of being carried by a suitcase. Beside wearing an Rt original “Neko Tencho(Cat shop master)” costumes accompanied with various purposes and applications. University’s mascot is one of the examples. Ric can be used in a wide range of entertainment. Due to the condition of the floor surface, walking may be difficult. This product is built to order. (The delivery time of the basic product will be three months.